I've mentioned that we're trying to eat better here in the Foodista household, and that often means inventing new, healthier alternatives to some of our favorite foods. Pizza is of course one of them and despite not eliminating red sauce altogether, we made a "Yin Yang" pizza - using a 1/2 and 1/2 approach, creating a "naked" and traditional pizza pie in one. 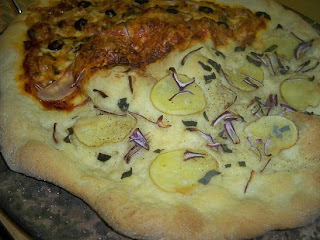 The "naked" half was simply dressed in olive oil, paper-thin slices of potatoes, fresh sage and red onions. It resembled and tasted more like focaccia bread than pizza--but that was fine with us, and I actually preferred it. The second half was snazzier and included marinara sauce from Mezzetta Napa Valley Bistro, with wine (Napa Valley Chardonnay) as an added component. I also sprinkled it with Mezzetta Napa Valley Greek Kalamata olives, which added more body and sweetness from the Cabernet Sauvignon that was incorporated into it. Leftover potatoes and red onions were also sprinkled on top and the overall effect was a more substantial, "meatier" pizza, although no meat was present. Try it my way or add some of your ingredients of choice. Roll out pizza dough to desired shape - it can be round or even square. I like a round rustic pie, and it doesn't have to look perfect. Sprinkle corn meal on the bottom to prevent it from sticking. Divide pie in half by brushing one half with olive oil and leave the other one for the marinara sauce. Top the olive oil side with slivers of potato, onions and fresh sage. Sprinkle with sea salt and freshly ground black pepper. 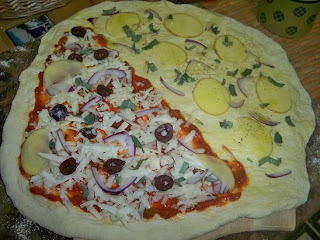 For the other half, top with marinara sauce, cheese, olives, leftover potatoes and red onion. Season with pepper if you like but it doesn't need more salt. Place the pie into the oven and bake for about 30 minutes or until the crust is golden brown. Cool for 5 minutes, slice and serve. It's delicious to alternate your bites between the red and the "naked" slices - indulge and enjoy! Wow, I'd say that's pretty gorgeous. Great job!